The Outta Sites (LA) – America’s #1 Beat band returns to the Bay Area! Featuring Chris Sprague of Los Straitjackets! Rue ’66 (SF/LA) – Rue ’66 plays unique, obscure, and truly authentic French yéyé music. Drawing inspiration from Serge Gainsbourg, France Gall, Jacques Dutronc, Françoise Hardy, Gillian Hills, Michel Polnareff and groups like The Zombies, Pussycat, The Searchers, etc., Rue ’66 is a nine-piece band sure to delight. 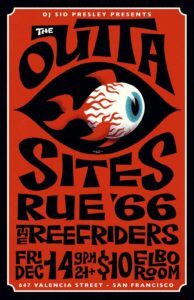 The Reefriders (Surf) serve up quite a collection of surf music taking their audience on a joy ride through time with wild music as popularized in the movie Pulp Fiction. The Devil-Ettes – Sassy, sultry, yet utterly All-American, The Devil-Ettes provide good clean fun for all! These Go Go goddesses have gained notoriety for settin the fringe a flyin’ at their wickedly wild high-energy shows. They are keeping the lost art of Go Go alive!